In the last few years, Yahoo made an announcement that it was filtering off its small business division to a different company called Aabaco. They made mention that the previous local business services Yahoo offered would be branded by Luminate. If that wasn't complicated enough, Yahoo then announced the outsourcing of its local business listings to Yext. Luminate is now gone. Yahoo Small Business is now Aabaco Small Business, and Aabaco outsources everything to Yext. 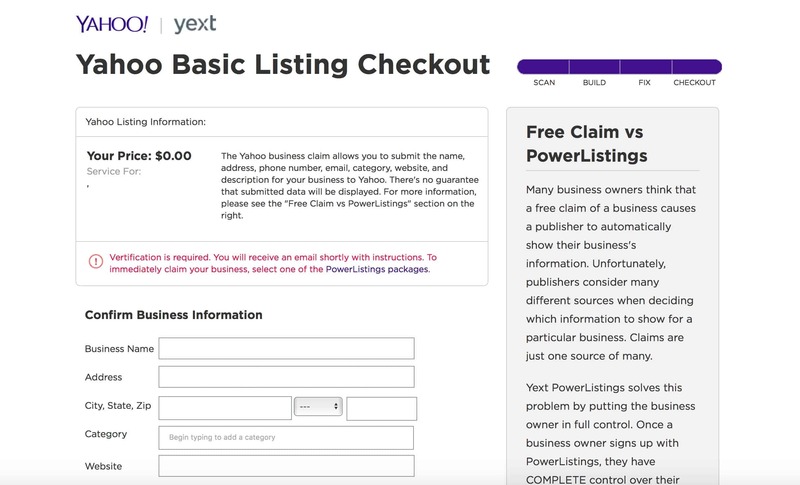 Yext then manages all the local business listings using a completely separate product called Localworks. What a confusing mess right?! No need to worry about any of this. Only one thing is truly important here and that is that you are still able to get a free local business listing on Yahoo. First, you need to visit Yahoo, then type in your Company name. You will see a link that says: “Add or update your business”. Click on the link and it will take you here: https://www.yext.com/pl/yahoo-claims/free-claim-checkout.html (or just click the provided link if you would like). Enter your complete information as best as you can and click “Find My Listings”. Next, a “powered by Yext” page will pop up. It will claim to have a large “error rate” and a bunch of warnings that claim that you are not being seen and you are not verified. Don’t worry about all of this as most of it is just sales tactics, ignore it and click the “Continue” button. From here, you are able to update your information on your listing. Be sure to completely fill out this page. Always use the same name, address, and phone number (NAP) that you find or use on other listings for your brand (I always refer to Google My Business if I'm not sure). Now, hit the “Continue” button to move on. Yext will then give you an option to buy 4 different plans of service, just ignore that and look below the plans. You will see a small link that says, “Claim your Basic Listing only on Yahoo” click the link. Now you will be sent to the “Yahoo Basic Listing Checkout” page. Just finish the checkout and click on the “Place Order button” (don't worry, it is free). Yext will promptly send an email to you to verify your email address. Be sure to click the verification link and create a password. You can then log in to your account. The Last step will have you verify that you represent the business you listed. The simplest way is to have them call you, or choose another method that may suit you better. That all of it! Now have free listing on Yahoo that is fully claimed and you can manage at any time. What About A Free Google My Business? Great question, it is highly recommended that you also have a local listing set up through a GMB. This will help you get found in search engines at a much higher rate in your local search results. All you have to do is submit your information to Google and they will verify your listing through sending you a post card in the mail. Any directories and local citations you can get your Company in will help you get found online. It will also help your online reputation by giving you more assets to control for your brand. If you don't mind paying the money, you can always set things up through Yext powerlistings, but that will coast about $45 a month. How To Claim Your Yahoo Free Business Listing	Overall rating:	5	out of 5 based on 48	reviews.